← Whats your story? Meet Brenda! As I posted on my Facebook group yesterday, I had my latest “photoshoot” (aka colonoscopy) this morning; I swear these things are getting easier to cope with! Now the hardest part really is not eating; last time I wrote about these I mentioned the bowel prep being the hard part, more from a psychological point of view from bad past experiences. Now that I’ve got my head around that being a freak event when my innards were in a bad place, this stage isn’t as nasty as I have hyped it up to be in the past. So this morning my grandparents picked me up to take me to the hospital; getting there early I went up to start the normal process of waiting around to be seen. After going through the usual health and allergy questionnaire I was given the option of sedation or gas and air; going on my last experience I opted for the latter. The longest part was sitting in the changing room before the procedure. I had been given the rather fetching hospital gown to put on, and just had to wait. Eventually I was called into the main room and introduced to the team. The gas and air was sorted out, my records were sorted, and then battle commenced. As in my previous exams, I watched the little telly set up while it was all going on, and in my usual spirit of things asked a series of questions, mainly variations of: “Whats that bit?” The consultant carrying out the procedure was talking me through what he was seeing and the results that he was observing. I found out that the ulcer noted in the previous colonoscopy had disappeared, which is great news. The not so great news is that a new one has appeared around the join in the gut from my surgery, where the small and large intestines meet. All in all the procedure wasn’t that bad; I didn’t really have any pain, and the most amount of discomfort I experienced was the feeling of really needing to break wind. Although the gas and air was there I only had one little puff of it and to be fair if I didn’t have that there I wouldn’t have really been too bothered. While it was going on, a few biopsies were taken (little samples of ulcer) for examination in the lab. I had also agreed before hand that if appropriate the hospital can use these samples for training purposes: it makes no difference to me what happens to them and if I can do a little bit to help the training of new medical staff then so much the better! Before long I was taken down to recovery. As I didn’t have any sedation I just needed to wait for my notes to materialise in the recovery room then I could be discharged. 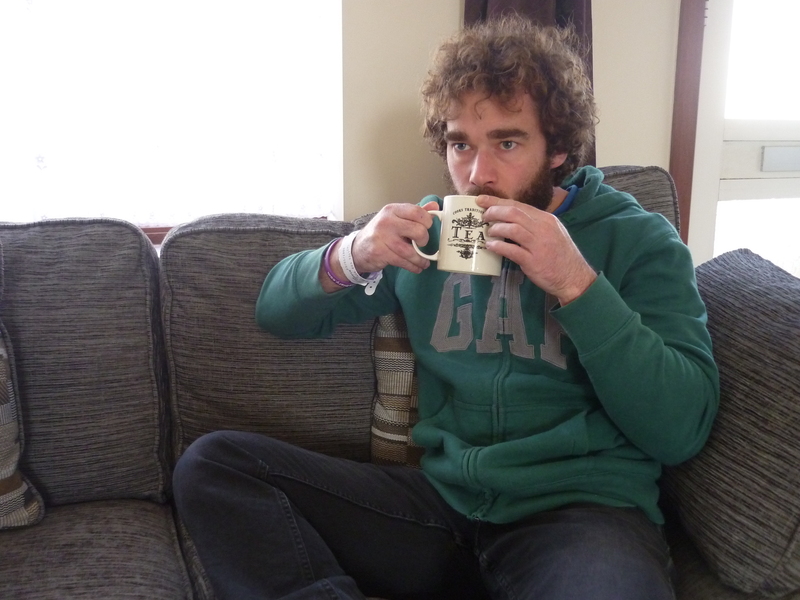 I was given tea and biscuits while waiting, and after not eating for over 24 hours they tasted absolutely amazing! Soon my notes came down, and I was told I could head off. After a spot of lunch in the little coffee shop in the hospital I was off home. Finally: at home relaxing with a much appreciated cuppa! So what happens now? Well the results will be sent both to my gp and my consultant, Dr. Saverymuttu. When Dr Saverymuttu has had a chance to take a look at these results I will have an appointment to have a chat with him about where things go now. I suspect, based on my last meeting with him, that my medication will be changed from the Mezalazine that I am currently on, to Azathioprine. The Mezalazine is an anti-inflammatory drug whereas the Azathioprine is a drug that controls the immune system, to try and prevent the body from basically attacking itself as it does with auto-immune diseases such as Crohn’s. I have been on this drug before for a long time, and know that it doesn’t cause me any problems, so I am not worried so much about that. What I will discuss aside from our next course of action, will be possible reasons for why the previous ulcer has managed to disappear. So that’s today’s exciting news; now life can resume, as can my eating! Thanks for reading people, have a great day! This entry was posted in Awareness, Background information, Crohn's Diary and tagged Colonoscopy, Crohn's Disease, Crohns and colitis awareness, Crohns and Colitis UK, Diary, Diet, IBD awareness, Progress, Research, Surgery. Bookmark the permalink.